I never really thought of brakes this way, but I suppose it is true. You can't make a really fast car unless you give it the ability to stop when its at those high speeds. So brake technology has to develop along with more powerful engines and vehicles. Check out that airspace between the cross-drilled iron rotor and the aluminum hat. Those little rods you see are bronze-coated pins. The rotor itself slides on those as it heats and cools. In addition, the design significantly reduces heat transfer to the wheel bearings behind the rotor hats. This is genuinely cool tech. Even the manufacturing process is fascinating: the rotor is machined, then the pins are inserted, then the aluminum rotor hat is cast into place. Wild. And of course, they're massive: 394 mm up front, and 380 mm out back, and actuated by fixed calipers—huge 6-piston affairs forward, and 4-piston aft. well if you're on a track or just want to drive fast, you have to drive to a level thats in line with how fast your brakes will stop or slow you down. when people buy fast cars sometimes one of the first performance mods they do is upgrade brakes. I'm looking forward to seeing how well the stock brakes hold up to track use. Hopefully I don't need to upgrade them. That will depend on you as a driver and of course exactly how what they give us performs on the track. Some might even jump to better pads from the start without giving stocks a chance. That will be a clear signal of RS's worked in nicely! I have never thought of it that way. I have always thought in order to go fast, you would need a better accelerator and engine. But to have a better brake? I guess it is like viewing the whole situation from an entirely new perspective and it makes complete sense. Never really though about the brakes as a contributing factor on how fast you go on tracks. 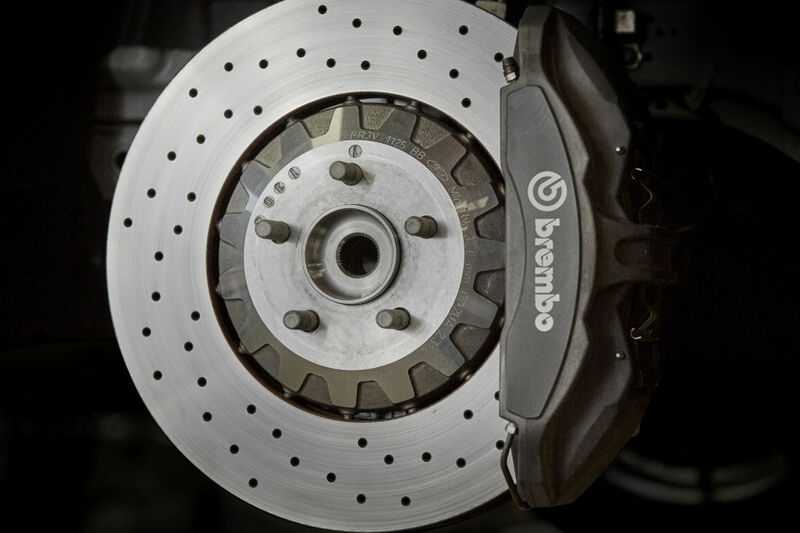 Good to know and the RS is already equipped with an amazing set of Brembo brakes. I mean.. not to sound like a d-bag or anything, but it's quite obvious. It's interesting that a lot of people think it's all about your horsepower and torque numbers. But on the track, you're brakes play a significant factor in you're performance and times. Brakes and tires are extremely key. Not only just changing pads and rotors, but changing the fluid, brake lines, even adding cooling ducts for your brakes help a great deal.